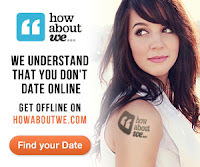 >The whole point of online dating is to meet in real life. Many people can’t seem to grasp this concept and I think some traditional sites aren’t set up to encourage real life dates. Yes, it’s wonderful to chat with someone in the virtual world, especially when we are all uber busy, but it can never substitute the face to face interaction. When I signed up for How About We, I was excited that their concept was focused on meeting in person as opposed to chatting online endlessly. I have to say, I think I fell into old habits. The first guy who caught my eye, I just sent him a message chatting him up about his profile. Mistake! I engaged in an interesting conversation, but never brought up the date he had posted. Then again, he didn’t post a date. And he never mentioned the three I had posted… We got to the texting phase, but never to the let’s have a drink phase. Which is pretty much my luck on other dating sites…a lot of effort, but very few dates. The second guy who caught my eye, when I contacted him, I mentioned his posted dates. One, because he chose one that I had posted and two, because he chose one that I thought interesting, but wondered if it would really get pulled off. Picking questions out of a hat? I think that could be fun, but I would definitely need a glass of wine to go along with the question and answer period. Barring any scheduling conflicts, I have a date pending for next week! If you are wondering why he posted the same date I did, it’s because the site let’s you repost dates that someone has already thought up. So, if you panic at the thought of coming up with a creative date on the spot, rest assured you can get some help. Also, if you see a date that’s posted, but doesn’t quite fit for you, you can easily modify it to fit your needs and preferences. Like the one that someone posted about getting BBQ restaurant take out and having a picnic in a park…I like that, but someone might not like BBQ. Who doesn’t like BBQ is beyond me, but you get the point.